I am a wife, author, and school teacher. I am happily married, love writing, and enjoy seeing the look on my students' faces when they finally get it! What some people don't know is that my husband and I collect moose! Yes, moose! We have over 200 and they have their own room. My Hero, My Ding tells the poignant story of Lisa and her grandfather and the overwhelming bond they shared. You’ll find yourself captivated with love, and find yourself gaining a deeper understanding of life-lessons. Experience the antics that were shared and discover the respect and affection between two ordinary people with an extraordinary connection. I always knew I loved my grandfather but it wasn't until after his death that I realized what a gem he was. Whether swimming at his farm, washing windows at his jewelry store in the middle of winter (you could only imagine), or playing with our imaginary dogs, Grandpa was sure of one thing...always make time to have fun in your day! I did not write my memoir only for myself, but to share with others the importance of family, fun, and life-lessons. This book should bring a smile to your face and hopefully bring back some great childhood memories of your own. 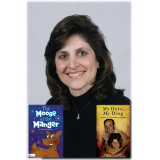 “My Hero, My Ding” by Lisa A. Tortorello, a memoir of a Girl and her Grandfather. In this heartwarming, endearing and life-touching story this Author shares her most treasured memories – times with her Grandfather. Although he became a jewelry maker and jewelry store owner, he gave her a rare gem, time and love, more precious than any of the jewels he had made. She found a rare treasure in their relationship – a treasure that would last a lifetime. These cherished memories etched a portrait in her life of not just a grandfather, but a hero. He left behind for her a treasure worth far more than gold. This book will touch your heart and reflect to other families to not let disagreements weigh you down, but perhaps be lifted by the spirit of love, that we can all possibly be the “hero” in the lives of those we love.